NGC 4217 (also known as UGC 7282) is a spiral galaxy of roughly 80,000 light-years across, located some 56 million light-years away from Earth in the northern constellation of Canes Venatici (the Hunting Dogs), while it is receding from us at about 1027 kilometers per second. This faint, edge-on galaxy looks like a thin sliver of light of which the northern edge seems to be brighter than the southern one. It is divided by a prominent dust lane which appears to be situated a little to the southeast side of the major axis of the hazy halo, while the striking central bulge seems larger and brighter northwest of the major axis. 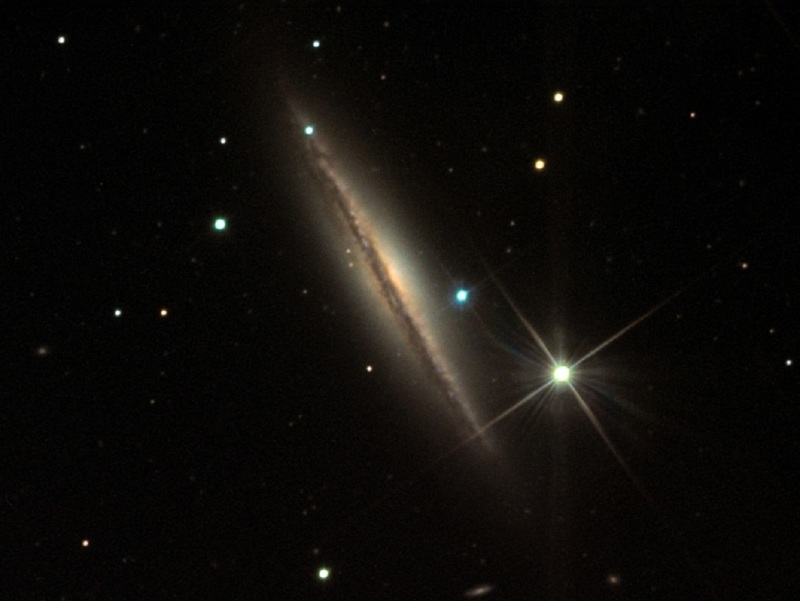 This seems to indicate that NGC 4217 is not quite edge-on, but has rather a very small tilt. Although it is located in the constellation of Canes Venatici, NGC 4217 is a member of the Ursa Major South Group, which contains 28 galaxies with a diameter above thirty thousand light-years. This group lies right next to the Canes II Group, which includes the spiral galaxy Messier 106 (also known NGC 4258). NGC 4217 is possibly a companion of Messier 106.